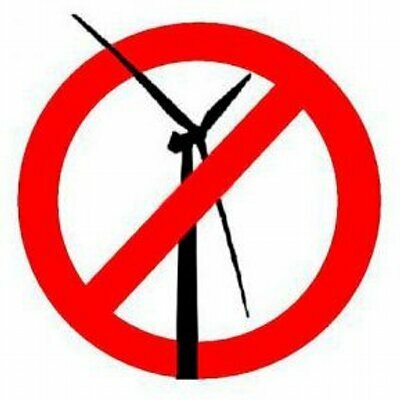 US Wind | Mothers Against Wind Turbines Inc.
At the Supervisors meeting of Oct 24, they adamantly denied the accusation that they had effectively let Invenergy and MidAmerican Energy write the Palo Alto County Wind Energy Ordinance. However, documents obtained by way of the Iowa Open Records Act indicate otherwise. The original ordinance, written Aug 11, 2016, clearly did not meet with Invenergy’s and MidAmerican Energy’s approval. In a memo from Invenergy and MidAmerican Energy to the Supervisors dated Aug 26, 2016, the company states, “there are some key provisions that must be changed if the county desires to attract and encourage the development of wind energy conversion systems” Following are some specific examples comparing the original ordinance with the one modified to meet Invenergy’s demands. Compliance with Palo Alto County Zoning Ordinance: Original: “requirement to obtain a certificate of zoning compliance in accordance with Article 9, Section 5 of the Palo Alto County Zoning Ordinance.” – Modified: zoning compliance eliminated. Setbacks from Permanent Residential Dwellings: Original: 2640 ft.- Modified: 1500 ft. Setbacks from Property Lines: Original: 1000 ft. – Modified: 120% of height of wind device (approximately 600 ft). Setbacks of Wind Energy Accessory buildings from permanent residential dwellings: Original: 2640 ft. – Modified: 1500 ft.
Drainage Systems: Original: “Permit required if underground electrical construction activity spans across organized drainage districts and private tile systems. – Modified: No permit required for affecting private tile systems. These are just some of the many changes demanded by Invenergy and MidAmerican Energy to increase the profitability of their project. Clearly most of the Supervisors, with assistance from other county employees, capitulated to every demand, without considering residents who are adversely affected by the project, and who elect and pay these county officials to look after their well-being. Instead, these same officials have forfeited the health, environment, and homes of some of their constituents to generate huge profits for companies like Invenergy, Mid-American Energy and its billionaire investors like Warren Buffet, and large wealthy landowners, most of whom are absentee. Nearly all major projects such as this involve costs and downsides, as well as any benefits. In this case there are many downsides, starting with the ill health effects on humans caused by shadow flicker, audible noise, and worst of all, infrasound, which can cause stress, sleeplessness, and nausea. Further, there can be adverse effects on farm animals as well. Also, wind turbines can kill many birds, especially when placed too close to lakes and wetlands. Therefore, it is so important to follow regulations and perform due diligence, neither of which has been undertaken by our county officials. “Rising over the treeless, rolling prairie and ranch lands, 15 miles west of this vibrant Osage County town, drivers along U.S. Highway 60 notice the sudden appearance of 84 wind farm towers, reaching hundreds of feet into the blue sky. Instead of the sounds of birds singing a summer’s song or a south breeze sweeping the bluestem grass, travelers will hear a slow, steady whirring noise, as the giant blades rotate in the relentless wind on the prairie, attached to turbines to generate electricity. At night, the slow, steady red blinking lights attached to the top of the turbine towers can be seen from a 30-mile radius. The Lesson: This project was a disaster from the beginning. Speed and greed are a recipe for environmental, economic, and social failures. Applications for future wind developments must learn from this experience and be much, much more diligent and responsible in their planning and execution. The Ocotillo Wind Energy Facility (OWEF)1 is an utility scale project placed on 12,436 acres near Ocotillo, California, of which 10,151 acres are public land managed by the Bureau of Land Management (BLM). Let’s not forget the towns of Ocotillo and NoMirage. Not huge towns, but home to 266 residents who chose the solitude, the quietness, and the beauty of the ever-changing seasons. Much of this beauty, along with the ecosystem, has been sacrificed. This wind energy facility now consists of 112 Siemens 2.3-108 MW Industrial Wind Turbines (IWT), which means each IWT was rated to produce 2.3 Megawatts (MW), and the blade swept area is 108 meters in diameter (354.331’). At a later date, the rating was increased to 2.7 MW per tower, very likely to meet the minimum installed capacity required by the California Public Utilities Commission (CPUC) if San Diego Gas & Electric (SDG&E) is to meet their mandated renewable energy requirements. The nacelle, which houses moving and support components such as the gearbox, generator, and main shaft, sits on top of a round tapered steel tower 80m (262.467’) above the ground. The 173’ long blades are held in place at a hub which is attached to the end of the nacelle. The total height of the wind turbine when a blade is in the 12 o’clock position is about 438’. The base of the tower is 15’ in diameter and houses the inverter and control equipment. Two cooling fans are placed outside of the base under the entry stairway, and the transformer is placed on the ground next to the base. More data can be found at Wikipedia2 and at the Siemens’ link3. All these links are posted in the “Notes” section online at http://www.desertreport.org. How did this happen? Initially, when we first heard about this project, we were told by Pattern Energy officials and by project documentation that we, the residents, would not be impacted by the turbine facility because it would be located five miles away from the Ocotillo Community. Five miles? That’s an acceptable distance. My wife and I now have turbines that reside one-half a mile from our house and with most less than one mile from the community on all sides. There were so many maps presented during the different meetings with the various Imperial County departments that confusion ran rampant when someone asked which map represented the location of the turbines for this project. During a scoping meeting, a meeting designed to gain input from every single entity, person, department, or facility that may be impacted by this project, the residents were not allowed to speak. Instead, we were instructed to write our questions on a post card, and they would be addressed at a later time. When? Now let’s talk about the turbine access roads. Initial discussions and documentation indicated that these roads would be thirty-six feet wide and then narrowed to sixteen feet once the project was complete. In addition there would be an additional fifteen feet on either one side or both sides for the electrical collection lines from each turbine. Some roads ended up being up to 113 feet wide. The disturbance caused to Native American sites and to wildlife has been recorded many times4.5. Many homeowners have felt the need to purchase flood insurance, in the middle of the desert. Residents feel that Pattern Energy was allowed to change the drainage patterns that will affect the alluvial fans, causing flooding by diversion of rain runoff. Construction of forty-two miles of access roads and an additional eighty-two miles of collection lines has stripped the water absorbing desert crust, creating the potential for flooding in areas that have been safe in past years. The next indiscretion that made itself Somewhere on this map is a community now surrounded by industrial project. known were the wind values. The wind values were incorrectly stated – records were from the Desert View Tower located ten miles up the Interstate Highway grade from Ocotillo and approximately another 2500 feet higher than the desert valley where the project is located. How were they allowed to use those numbers? 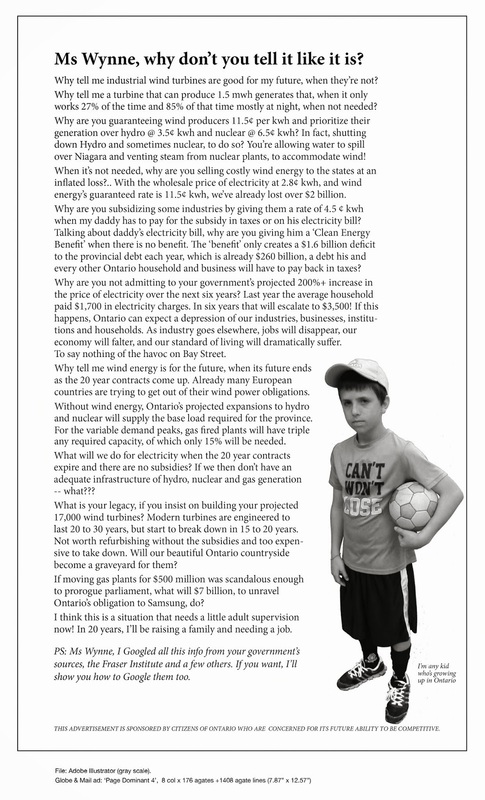 Three years of data have shown that these turbines are not generating the power that was projected. During the permitting process, differing estimate were given for the energy production of the facility depending upon who made the estimate and for whom they were intended. Ultimately Patten Energy stated that the OWEF would have a capacity factor of 34% (meaning that over time it would produce 34% of its maximum rated output at full sunlight) and that it would produce 2673 gigawatt hours (GWh) of energy in its first three years. In fact, the actual capacity factor during this period was 21%, and the total energy produced was 1438 GWh, far below the projected figures. This was in spite of receiving $115,890,946 dollars from the Department of Energy’s 1603 Cash Grant Program6 in lieu of the Production Tax Credits and $110,000,000 from the Border Environmental Cooperation Commission7. During the BLM scoping period for the project, many comments were submitted. The majority of these were in opposition to the OWEF. Comments that favored the facility were mostly based on the jobs and economic benefits that the facility would provide. A small minority of the comments favored the facility because of the sustainable renewable energy benefits. Those claims were based on the “Installed Capacity,” which is the maximum power which the facility can generate at full daytime sunlight, and an expected capacity factor of 34%. Ocotillo Wind, as stated previously, has fallen far short of predictions. Current electricity generation for the residents of California relies on a mix of energy production technologies including: coal (7.7%), natural gas (41.9%), nuclear (13.9%), other renewables (13.7%), hydroelectric (10.8%), and others (12.0%). Based on nearly 204,000 GWh of net power generation in California in 2010, the average annual production of 479 GWh by the Ocotillo facility represents only 0.2 percent of California’s total. It is reasonable to wonder if the negative consequences of the project can be justified by this small contribution. The OWEF has been plagued by mechanical problems. On May 16, 2013, a 173’ long wind turbine blade was thrown off of Turbine 156. The cause was determined to be a fiberglass root segment curing problem. Ten wind turbine blades were ultimately replaced at Ocotillo Wind. Many people familiar with the facility believe that the blade problem was due to the “fast tracking” of the facility to enable Ocotillo Express LLC to complete the project by the end of 2012, so they could qualify for the 1603 Cash Grant offered by the Department of Energy. On January 15, 2015, Turbine 110 had a major fire. The cause of the fire was never revealed. The entire turbine was eventually replaced. The turbine did not generate power for nine months. The OWEF has been plagued with oil leaks. The residents of Ocotillo have counted over seventy turbines with oil leaks at towers and countless hydraulic oil leaks on the blades, many of them considered to be significant by the Imperial County Environmental Task Force. Additionally failures of yaw drives (which orient the blades into the wind) have caused problems. Eight gearboxes have been replaced since the facility became 100% operational along with hundreds of yaw drives. The bright red blinking lights of Ocotillo Wind are required by the Federal Aviation Administration (FAA) and can be seen from the southern portion of the Salton Sea, over seventy miles away. Nobody lives in the desert to view wind turbine lights blinking in unison all night long. Pattern Energy promised the community a lighting control system which would be radar activated only when aircraft were present. The Laufer System9 was approved by the FAA in January of 2016. Pattern constructed the whole first phase of Ocotillo Wind consisting of ninety-four turbines in a record 6 1/2 months, but it has been over a year, and the very irritating red lights still shine. Many birds have been struck by the wind turbine blades, and bats lungs have exploded as they fly near the turbines. A carcass survey between 10/05/14 and 09/22/15, obtained by a FOIA request, indicated that sixty-nine birds and bats were found on the agreed upon survey sites, under or near the wind turbines. Every wind turbine site on the facility was not searched every day. We can assume that scavengers consumed many of the carcasses prior to the survey. Bird kills don’t appear to be a huge problem in Ocotillo, but we all hate the killing of any wildlife. The once numerous Red Tailed Hawks have disappeared. Were they killed by spinning wind turbine blades? There were once so many jackrabbits that it was overwhelming. Now there are no jackrabbits, and the coyotes have also disappeared completely. The last time we saw one, it was skinny and sickly looking, almost certainly for lack of food. The ecosystem is gone. This project was a disaster from the beginning. Speed and greed are a recipe for environmental, economic, and social failures. Applications for future wind developments must learn from this experience and be much, much more diligent and responsible in their planning and execution. Feds List New Bird Species As Threatened – Should Wind Developers Be Worried? 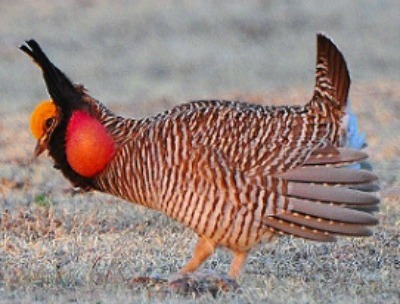 In response to a precipitous decline of the lesser prairie-chicken (LPC), the U.S. Fish and Wildlife Service (FWS) announced on March 27 that it is listing the species as threatened under the Endangered Species Act (ESA). Under the ESA, a “threatened” designation means the species is likely to become in danger of extinction within the foreseeable future. Threatened-species status represents a step below “endangered” and, as such, carries fewer restrictions. Nevertheless, the listing of any species under the ESA has immediate and long-term implications for both energy and agriculture interests. And because the LPC resides in the wind-rich lands of Colorado, Kansas, New Mexico, Oklahoma and Texas, rest assured that listing will impact wind developers now and until the species recovers and is de-listed or it goes extinct. According to FWS Director Dan Ashe, “The lesser prairie-chicken is in dire straits.” Last year, the range-wide population declined to a record low of 17,616 birds, an almost 50% reduction from the 2012 population estimate. This once-abundant relative of the greater prairie-chicken, greater sage-grouse (GHG) and other “prairie grouse” species has been reduced by an estimated 84-90% from its historical levels as a result of the human-induced degradation of its preferred habitat. And with land-use pressure from energy development, and agriculture and urbanization on the increase in the West, the prognosis for LPC remains bleak. Historically, LPC were common in sand sagebrush-bluestem and within shinnery oak-bluestem vegetation types. Currently, LPC are most common in dwarf shrub and mixed grasses on sandy soils, as well as in short-grass or mixed-grass habitats on loamy or clayey soils. In Colorado and Kansas, LPC are typically restricted to sand sagebrush communities dominated by sand dropseed, side oats grama and blue grama. Recently in the northern fringe of its range, LPC have moved into mixed-grass prairie and Conservation Reserve Program (CRP) fields. And although all these vegetation elements are important to LPC, the thing they need more of than almost anything else is what is increasingly in short supply – large and contiguous expanses of undisturbed habitat. In order for LPC to sustain viable populations, it is estimated they need contiguous units of their preferred habitat that are a minimum of 25,000-50,000 acres in area, or coincidentally, about the size of an average wind farm in the Great Plains. A century ago, the heath hen, a New England relative of the LPC, went extinct due to similar cumulative impacts resulting from destruction of its preferred habitat. As early as next year, this same ESA-listing scenario may play out with another increasingly rare western bird, the greater sage-grouse (GSG). However, the impact of that listing will be even more far reaching because GSG will be listed as an endangered species, as opposed to threatened species for LPC. Also, GSG and their preferred habitats are found in 11 states, as opposed to five states for LPC. While habitat quality and habitat size are critical, LPC live in such mortal fear of being preyed upon by hawks and eagles that they will abandon otherwise-suitable habitat simply because it contains an elevated perch that a bird of prey may someday land on and hunt from. This means that vertical structures of almost any kind, be it a wind turbine or telecommunication tower, will render otherwise-suitable habitat unusable by LPC. Studies have indicated that LPC habitat is also degraded by proximity to roadways, buildings, and oil and gas fields. The upshot of these ecological proclivities is that, according to the FWS’ LPC Conservation Plan, once a site has been designated as LPC habitat, it is recommended that “avoidance buffers” be established between such sites and the following human impacts: 300 feet to the nearest gravel road; 600 feet to the nearest distribution line or residential building; 900 feet to the nearest oil or gas pad; 1,800 feet to the nearest transmission line; 2,250 feet to the nearest paved road; and 3,000 feet to the nearest wind farm, commercial building or tall telecommunication tower. These large buffers were derived from careful scientific study of the observed responses of LPC to these various land-use features. The proposed buffers are particularly large for wind farms and telecommunication towers because studies showed that LPC were particularly sensitive to them. These 3,000-foot buffers will invariably result in fewer turbines and tall towers in areas that also host LPC populations or their preferred habitat. Due to a special deal struck in 2013 (under section 4(d) of the ESA), the regulatory impact to wind power companies from formal ESA listing will be somewhat less than it would have been otherwise. Yet, by no means will it be “business as usual” for wind power in any of the states that host remaining populations of LPC. Specifically, the special 4(d) rule will allow the five states to continue to manage conservation efforts for the species under the Western Association of Fish and Wildlife Agencies’ (WAFWA) range-wide conservation plan. Under the WAFWA Mitigation Framework, a metric system of debits and credits has been established whereby land-use actions that result in an impact to LPC and their habitats will generate debits, whereas land-use practices that result in impact avoidance or improvements to LPC habitat will generate WAFWA credits. In doing so, WAFWA is providing opportunities for both the exchange and conservation banking of debits and credits. The listing of the LPC as a threatened species is the inevitable result of a century or more of cumulative human impacts. Therefore, wind companies considering developing or investing in any project site that may support LPC or LPC-preferred habitat are advised to conduct all requested pre-construction site assessments, perform all post-construction monitoring, report any bird fatalities to FWS as required by law, and proactively engage in the WAFWA Mitigation Framework. It is particularly vital to hire certified ecologists who know LPC ecology, have worked in the states where LPC reside, and are intimately familiar with endangered species biology, WAFWA and the ESA. Dr. Richard H. Podolsky is a certified senior ecologist who specializes in endangered species biology and is CEO of Avian Systems, a biological consulting firm that conducts bird and bat surveys. Podolsky can be reached at podolsky©att.net or (207) 475-5555. ‘Runaway’ Wind Turbine Poses Possible Threat To Akron, IA Community.